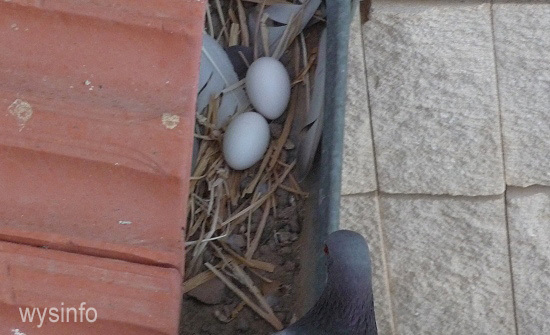 Yes, many of us love pigeons because they are associated with love, peace, family, dedication, stability, faithfulness …but to be honest, mostly we would like to see them far away from our balconies, roofs and houses. 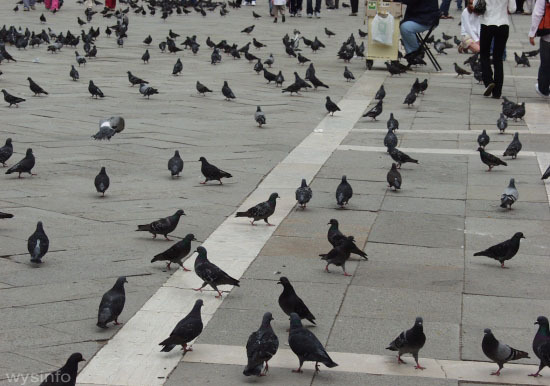 Most city pigeons are descended from cultivated pigeons that became wild. They breed frequently, multiplying at a rapid rate, and have become a substantial problem for the people they live beside. When they were in captivity and bred for profit, their fast reproduction was an advantage. But when they started to breed as free agents they became a nuisance. 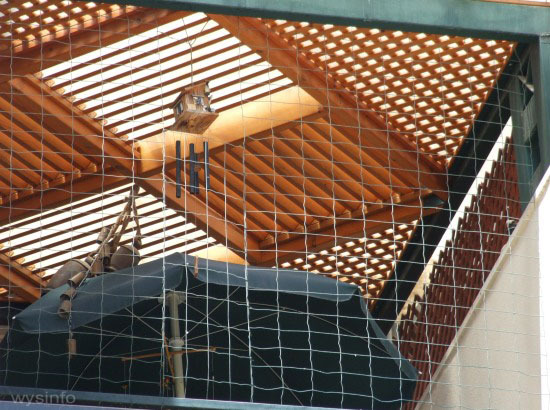 They often build their nests in inconvenient locations such as church steeples, chimneys, window ledges, roofs etc. The main irritation is their droppings, but they also present health concerns since, like other wild animals and birds, they sometimes carry diseases and often are the source of lice. They are known to carry bacteria and viruses, and their droppings present serious hygienic problems. It is not surprising, therefore, that a number of different industries have developed to help people get rid of them. Research has been conducted around the world in an effort to find a humane way to control this nuisance. In United States campaigns were launched to feed ‘birth control’ pellets to pigeons. Apparently in Los Angeles this resulted in some degree of success – they didn’t get rid of the pigeons but the population was reduced. In Paris they supposedly attempted to control the number of eggs that were allowed to hatch. Needless to say, many are opposed to interfering with nature in such ways. Another interesting experiment was the attempt to transport large numbers of pigeons away from a city into the country – but the pigeons’ natural homing instincts brought them quickly back to their old neighborhoods. Some communities have laws forbidding people to feed the pigeons, in the belief that the feeding encourages habitation in those areas. There are some people who think the best way to limit them is to shoot them – not a favorite among bird-lovers. 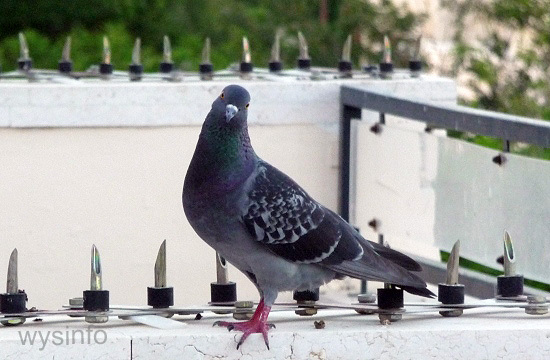 Spikes on all flat accessible surfaces like window sills or balcony walls: this often looks horrible and the pigeons are very agile – they can dance their way around the spikes without too much trouble. Painting/spraying glue on the roof, window sills and overhanging ledges. This actually works for a while, but is not an easy task and has to be repeated because the glue dries up. This doesn’t hurt the pigeons too much. Their feathers get stuck to the glue and, we assume, it’s painful to pull away. Once they leave they don’t come back too quickly. This is something we have tried and it does work for a while. Mechanical Hawks. There are simple robotic hawks and, apparently, there are flying mechanical hawks that have been used at airports to keep other birds away. This is a very expensive solution but maybe a fun hobby for some. Or maybe better still, get a real hawk. Those people who pursue hawking and falconry, a popular sport, are considered the natural enemies of those who are pigeon fanciers. 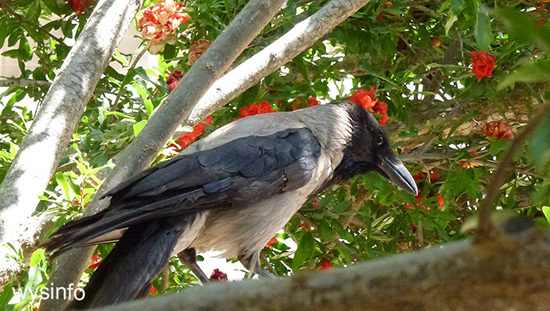 Enemies such as common crows, which have been known to eat, among other things, eggs and nestlings of other birds. Low voltage electric wires are effective in keeping pigeons away. When they touch it, they get the 7-12 volts shock, feel uncomfortable and leave. Ultra sound systems are effective to an extent. The system generates sound waves that a human ear cannot hear. The pigeons, feeling disturbed by the sound usually leave the area. Here’s an interesting one – Paint surfaces with Methyl Anthranilate, a substance derived from grapes. They say that birds hate the taste. We’ve never tried this one – but who knows. A system of sprinklers with sensors. When the pigeons land, the sensors give an order to a control unit to start the sprinklers spraying water. The pigeons are caught by surprise and fly away. Before going into the expense of buying systems that may or may not work, if you have old CD’s that you do not need, and you also have some artistic inclination, try to hang them from the roof of your house with strings. The constant movement of the CD’s and the reflection from the sun can do miracles. Another idea, if you live in a windy area, is to build a structure of mobiles. However this lacks the extra value of the reflection that the CD’s give. Here’s a suggestion for a sunny window sill or any other contained area – cactus plants! Make sure you plant cactus that really hurt when you touch them. We have some experience with this and so far it’s done the trick. The most effective deterrent is a house cat who is not afraid of climbing around the areas where the pigeons built their nests.